Built on plots identifiable on Frenchman's Lane in Rocque's map of 1756, this collection of warehouses forms an important industrial element in the streetscape. The laneway in 1756 would have been on the outskirts of the city, with these warehouses serving the docks to the south, having Ship Buildings Street close by to the southwest. The row can be identified as being built in the early eighteenth century due to their roof profile. The laneway is significantly shorter than that shown on Rocque's map, which was cut off to the west in the late eighteenth century to make way for Gardiner Street Lower which linked the newly built Customs House with Mountjoy Square to the north. 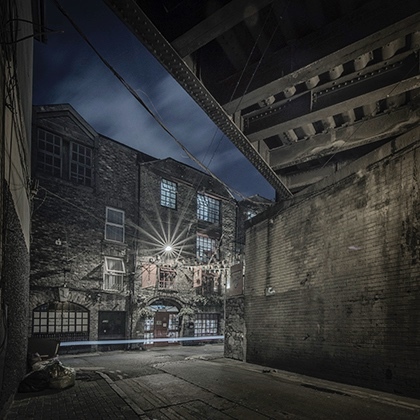 Frenchman's Lane became intersected by the Loop Line Railway bridge, alternately known as the Liffey Viaduct or the City of Dublin Junction Railway, constructed between 1889 and 1891 to link Connolly Station on the north side of the river to Westland Row on the south. These fine brick and stone warehouses are a valuable reminder of the historic nature of Frenchman's Lane and the industrial heritage of this part of the city in the eighteenth century.